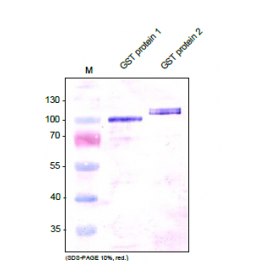 The anti-GST-tag antibody was generated by immunization of rabbits with a highly purified GST-tagged protein produced in E. coli. Glutathione S-transferase (GST) was originally cloned from parasite Schistosoma japonicum and it is now a widely used protein fusion partner. Vectors containing GST Tag have been developed for both prokaryotic and eukaryotic systems. 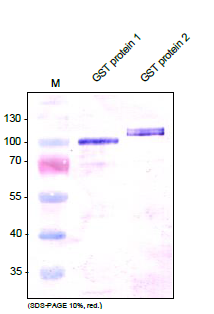 The GST fusion proteins are easily purified from cell lysates by affinity chromatography using Glutathione Sepharose 4B to elute out the GST fusion protein from the column with a denaturing form of glutathione. Using anti-GST antibody provides a simple solution to detect the expression of GST fusion proteins in cells. Restore in sterile water to a concentration of 0.1-1.0 mg/ml.